How to Convert FLV to iPad for Playback on Apple iPad Using FLV to iPad Converter? So, most videos from YouTube, Google Video, Metacafe are FLV format, and not be supported by Apple iPad. If you want play the FLV files on iPad, you need convert FLV videos to the iPad friendly format. Many people would only put it in MP4 format and then transfer to iTunes. Here I would like to introduce you a directly way of converting FLV to iPad. MacX Video Converter Pro can help you straight convert FLV to iPad on Mac. This program works seamlessly on Mac (MOjave incl.) computers to convert any popular formats to iPad, like MP4, MKV, AVI, MTS, FLV to iPad (iPad Pro/Air 2/mini 4 etc), iPhone X/8/7, Android and more. It delivers the world's fastest FLV to iPad transcoding performance on Mac as it's the first Mac software that uses Intel's QSV/Nvidia/AMD hardware acceleration tech! What's more, it also works as an online FLV video downloader and converter, which is able to free download and convert online FLV videos to iPad from YouTube, Vevo, Vimeo, Dailymotion and 1000+ sites more! World's fastest iPad converter to transcode FLV clips to iPad Pro/mini 4/Air 2 etc with the 5x faster speed than other iPad FVL converters and no quality loss. The following will take this FLV to iPad converter Mac for example to introduce the step-by-step guide. Step 1: Load your target FLV file by clicking "Add File". After free download this iPad FLV video converter on Mac, click "Add File" button to load the FLV files you want to convert to iPad. Select the output video you desire. Here we choose "to iPad". You can choose Flv to iPad Pro, iPad Air 2, iPad mini 4 and other types as you neeed. After finish the above steps, click the "RUN" button to start to convert FLV to iPad on Mac , you could view the conversion progress and are able to cancel the converting process at anytime. 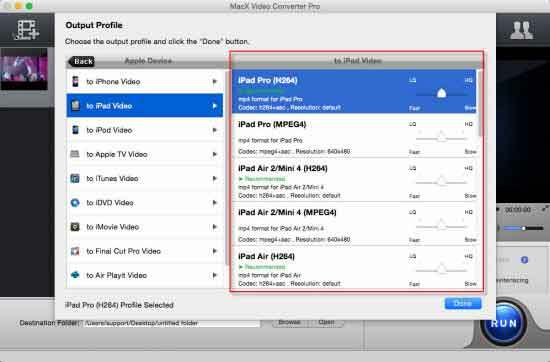 Note: MacX iPad Video Converter also enables you to convert input video to YouTube FLV, so with this Mac iPad video converter, you can convert the downloaded YouTube video on iPad as well as transfer the video to FLV and upload to YouTube, Metacafe, Myspace, etc.